When it comes to protecting your boiler from corrosion there are two aspects you need to look at, first is choosing the right chemical treatment and the second is hotwell/feedwater temperature. Lets take a brief look at hotwell temperatures first. 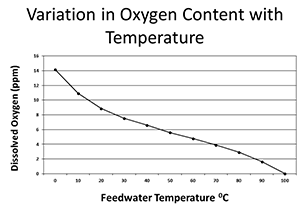 The oxygen content of water reduces with rising temperature as shown in the graph, as shown. Simply raising the feed water temperature and giving the oxygen sufficient opportunity to escape, will significantly reduce the risk of oxygen corrosion. The feedtank temperature should be maintained at a minimum of 80°C. This should be achieved by returning as much hot condensate as possible and by steam injection. A feed temperature of 85-90°C is ideal, but you should avoid pushing the temperature too high, since it will encourage cavitation damage in the feed pump. For a free on site consultation and to discuss improving the efficiency of your boiler system to reduce fuel, water and running costs please contact us. 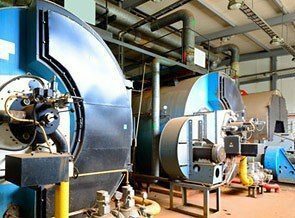 Deciding on the best chemical treatment for your boiler system. All good boiler water treatment regimes include a chemical oxygen scavenger to remove the residual oxygen from the boiler feed water in order to protect not only the boiler but also control corrosion in the hotwell (or feed tank) and the condensate return lines. The popular choice for boiler corrosion control is with out a doubt sodium sulphite or sulfite. Ideal for low pressure boiler applications. Feedwater can provide cost effective high quality British manufactured sulphite treatments including multifunctional treatments combining alkali, phosphate and polymers for all round protection. If you would like to discuss sulphite treatment for your boiler give us a call or even arrange for a free on site consultation. Some of our selected chemicals are also available to order online in our web shop. Corroban 27 – FDA-approved highly concentrated sulphite for maximum cost effectiveness. Sulphite isn’t for everyone and in fact if you talk to old timer boiler men they will probably tell you that Tannin is still the best and easiest method of treating a boiler. they are particularly suitable for low or variable feed water temperatures and very good at protecting idle and intermittently used boilers. Whilst often seen as a traditional boiler water treatment chemical, Feedwater tannin products use high quality freeze-dried tannin extracts, chosen specifically for their oxygen scavenging performance and are blended with state of the art polymer sludge conditioners and alkalinity builders. Feedwater’ tannin products are suitable for most low pressure boiler applications and are particularly popular with operators of steam engines, locomotives, traction engines and heritage steam boilers. If you would like to discuss tannin treatment for your boiler give us a call or even arrange for a free on site consultation. Some of our selected chemicals are also available to order online in our web shop. Boilertan 4 – A liquid tannin oxygen scavenger which is a direct replacement for DM 4 in 1. Polytan 4F – A mildly alkaline multifunctional tannin chemical incorporating two polymer sludge conditioners. Polytan 4C – A strongly alkaline multifunctional tannin chemical incorporating two polymer sludge conditioners. Polytan 8F – A highly concentrated liquid tannin treatment incorporating a polymer sludge conditioner (FDA approved).